MEN'S AND BOYS' SHIRT Closing in Coat Style, or to be slipped on over the Head. Shirt closed in Coat Style, having High Neck with Turn-down Collar, or Open Neck with Low Collar. Shirt to be Slipped on over the Head, Having High Neck finished with a Band. Back Plain or Gathered, and Shirt Sleeves with Straight or Turn-back Cuffs, and perforated for Short Sleeves. It's interesting that the featured illustration is for the casual, low-necked version, which I think is quite dashing. The soft tie is probably a rolled black silk square, widely worn at this time with middy blouses. The look brings to mind Douglas Fairbanks, though without our model's slightly dumpy physique. If the dropped waistline of this period was hard on women, it was absolutely style death for men. Note that men's shirts at this time are making a transition from pull-over to button front, or as it's called here "coat closing." 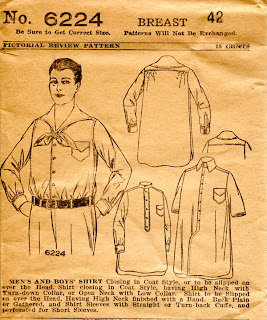 This pattern attempts to cover all the bases, providing pull-over and coat closing styles, long and short sleeves, two different attached collars, and a band collar to which a stiff purchased collar could be buttoned. This pattern is unprinted. The construction instructions, which are reasonably detailed, are printed on the back of the envelope.